For Those Who Have Bravely Served Our Great Nation! VA IRRRL stands for Veteran Affairs Interest Rate Reduction Refinancing Loan. 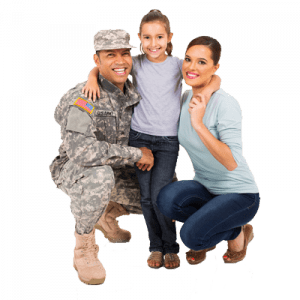 Also known as the VA Streamline Refinance Program, it was created by the U.S. Department of Veteran Affairs to assist service members in refinancing a previously existing VA loan without having to pay extra costs. The bottom line of this loan is clear and concise: it turns a preexisting VA loan into a brand new one, typically resulting in a diminished interest rate. This type of loan also requires significantly less documentation, making it a quick and simple process. You may only us a VA IRRRL if the new loan’s interest rate is smaller than the initial loan’s interest rate (1). You cannot take out money using a VA IRRRL. Proceeds can only be used to pay the initial VA loan, and/or the costs for the new loan. “Out of pocket costs” can be prevented by putting them toward the new loan, or having them paid for by accepting a higher interest rate. VA IRRRLs can only be used to refinance an already existing VA loan previously set up by the borrower using their VA entitlement. VA Funding Fees have been marked down to .05%. Should you be refinancing an investment property, documentation proving that you previously occupied the property is required. VA loans must take priority over all other home loans. Any practical number of points can be purchased by the borrower, but no more than 2 points may be rolled into the new loan. Since private lenders are the ones who take the risk by funding the money, they have special underwriting latitude and may ask for additional requirements, such as asking for an appraisal despite the loan not requiring it. Any added lender-imposed requirements are known as overlays. The Department of Veteran Affairs does not establish the highest possible loan amounts for VA loans. Having said that, the VA Loan Guarantee allows all VA loan programs to have an organic high-price price threshold. Like other VA loan programs, VA IRRRLs promise 25% of the loan amount. Because of this, lenders will fix the amount of extra risk they undertake by adjusting their specifications based on the amount of money the VA IRRRL backs. Although the VA loan limit varies by county, the limit is generally $417,000. Death or Divorce with VA IRRRL? Typically, those obligated to pay the initial VA loan are obligated to pay the second loan, but sometimes that’s not possible. Things happen, and it’s important to understand what happens when obligations change. Contact a VA associate for more information on obligation changes. A certificate of eligibility aren’t required for a VA IRRRL. You were already approved for the initial VA loan.You can change your lender if you choose. These loans can be processed by any VA-approved lender. You can refinance a VA loan even if there is a second mortgage on the property. The VA IRRRL will replace the VA loan, not the second mortgage. So the second position lien holder must agree to subordinate the second mortgage and let the refinanced VA loan to take priority. You cannot use home equity to pay off other debt by refinancing with a VA IRRRL. There is potential to be reimbursed up to $6000 if energy efficiency renovations are completed within 90 days of the loan closing date.